The mouth of the pacu fish — gigantic, 60-pound cousin to the more well-known (but much smaller) piranha — demands respect. Its brawny jaws and nightmarish teeth, the bottom row of which resembles a full set of exceptionally pointy human canines, are designed for crushing and tearing at seeds and nuts, its primary food source in the freshwater rivers South America. 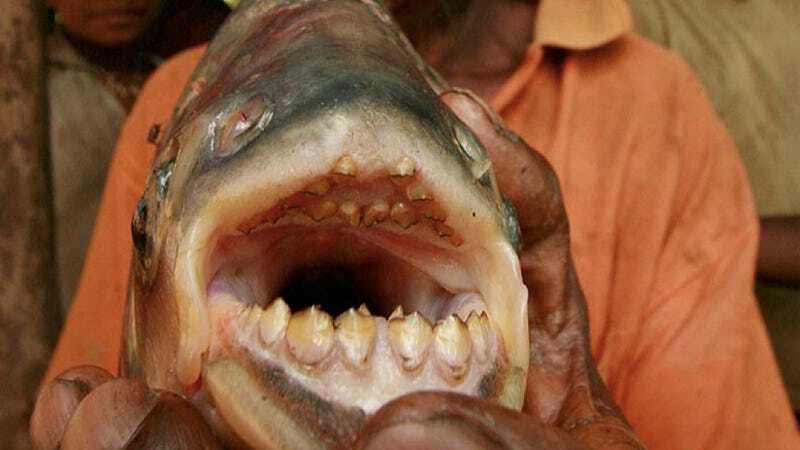 Unfortunately for anglers and swimmers in Papua, New Guinea (where over 14,000 of the fishes were released in the 1990s), the pacu's jaws are also uncannily suited to the crushing and tearing of another kind of nut. Yes, those nuts; Papuan locals don't call the pacu fish "Ball Cutter" for nothing. The total number of testicles to be forcibly claimed by pacu is unclear, but according to The Telegraph, Ball Cutter fish are responsible for at least two cases of death-by-castration. Harrowing stuff, to be sure, but also incredibly interesting: pacu are actually widely referred to as "vegetarian piranhas," and are known to play an incredibly important role in the ecosystems they inhabit by dispersing the seeds of trees, the fruits of which they typically eat. But according to Animal Planet, the relocated pacu of Papua turned carnivorous in 1999 as their go-to grub became harder to come by.